The High Power Monocular Telescope features the Pajuva latest monocular technology that offer the 16X closer clearly view of the things. It includes the wide-angled 50mm lens so you can enjoy the higher level performance (211 ft 1,000Yds). High Power Monocular Telescope features the sleek and stylish anti-slip design with the waterproof, Fog-proof and moisture proof capabilities that won’t let the dust, debris and moisture to get into the device. Perfectly suitable for outdoor activities such as for Hiking, Hunting, Climbing, Bird watching, Watching Wildlife and Scenery, Golf, Scope, Surveillance, concerts and travelling etc. You can purchase the amazon imported High Power Monocular Telescope by doing online shopping in Pakistan. It has adjustable eye cups that you can manage easily for optimal viewing with or without glasses. 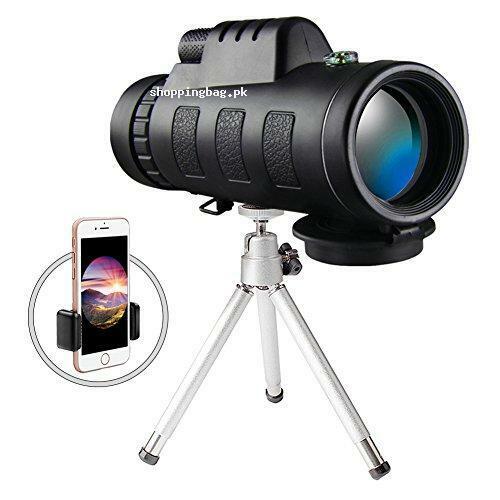 The High Power Monocular Telescope is compatible with the iOS and Android device including iPhones, Samsung Galaxy, Edge, Note, Google Pixels, LG, HTC, Sony, and many other available on the market. 【IP44 Waterproof, Fog-proof and Anti-slip Design】Prevents moisture, dust, and debris from getting inside the monocular - designed to inhibit internal fogging, fit for daily use and most outdoor environment. Moreover, the external textured rubber makes it comfortable for single hand focus, preventing from slipping out with excellent user experience. 【ADJUSTABLE EYE CUPS】Adjustable eye cups can be easily and rapidly twisted up and down for optimal viewing with or without glasses. Center focus knob allows you to focus easily with on hand. 【Perfect Phone Telescope with Strong Compatibility】Along with convenient phone adapter and tripod, this powerful hand held monocular is compatible with iphone X, 8/8plus, 7/7plus, 6/6plus, 5/ 5s, Samsung GALAXY S8/7/6, Edge , Note, Google Pixels, LG, HTC, Sony, and almost all other smart phones on the market.